Good afternoon, Mr. and Mrs. America and all the ships at sea! I’m an Optimist. You must be the Cavalier fans I’ve heard so much about. Please, gather round for another installment of that meshugenah megillah that we like to call NEWS … AROUND … THE … LEAGUE. I don’t know about you. But I’m experiencing a palpable sense of relief today. On Thursday night, the National B.A. crowned a new Champion – the Miami Heat. You might have read about it. After winning Game 1 in Oklahoma City, the Thunder looked their age for the remainder of the Finals, dropping the next four contests. On Thursday night, Miami clobbered the Western Conference Champs to seal the deal. Miami’s title is the franchise’s second – their first since 2006. The only reason I’m leading off with this instead of the usual birthday celebration gala or today-in-history crap is because A. it literally is news from around the league, and B. because of a Miami player who had a highly-decorated career right here in Cleveland before taking his talents to South Beach. Of course, I’m speaking of fellow Concrete State University graduate, Norris Cole, who canned a critical three-pointer in Miami’s 121-106 victory in Game 5. The Dayton native – and only person to be named Horizon League Player of the Year and Defensive Player of the Year – shot 43 percent from beyond the arc for the series. The flat-topped Cole did Coach Waters and the fast-rising Viking program proud. Former Cavalier small forward LeBron James also played well, battling a nasty bout of cramps to earn his first Ring. That guy who burned LeBron’s jersey on the news following “The Decision” two summers ago was probably furious and/or crestfallen. But I would say most Clevelanders have made peace with James. We’re just not the type of sports fans to hold a grudge. I, for one, say mazel tov, LeBron James. It would have been nice if he’d stuck around to win a Championship here. But he walked off the set of his own story. That’s OK. We’ll win our own soon enough and it’ll be WAY sweeter. And if I’m going to dedicate valuable column space to a true hero from Akron, it sure as sugar ain’t gonna be a tribute to LeBreezy. If you want to know about a real legend from Akron, learn the story of former Cavalier public address announcer Howie Chizek – who passed away this week at the age of 65. Chizek’s Cavalier career was a mere scintilla of what the man accomplished in his 65 years. Chizek began broadcasting his local talk show on WNIR in Akron on June 3, 1974 and did so until his recent passing. That 38-year reign is the longest-running no-guest talk show in America. In that span, the show had a listenership of over 300,000 and ran six days a week – five hours every weekday and three hours on Saturday at Klaben Ford. And even that barely encompassed all that the University Heights native accomplished. He founded numerous charities, including the Helping Hand Food Program to feed people in Akron and New Adventures youth program. He volunteered for 21 years as assistant head coach of football and baseball at St. Ann’s School in Cleveland Heights. Howie Chizek passed away this past Saturday in Orlando – where he was taking ten underprivileged children on a trip to Disney World as part of his annual New Adventures charity. If that doesn’t warrant a silent tribute from you knuckaheads, I don’t know what will. So, in memory of the late, great Howie Chizek, let us please closeth our cakeholes and removeth our hats and/or hairpieces for this Wine and Gold Moment of Silence™ …. With all the goings-on this week, this particular N.A.T.L. has been completely bass-ackwards, I’ll admit. But you readers certainly know that the first rule of getting out of a hole is to stop digging. Four on the Floor – As several of you know, this Thursday night is the 2012 NBA Draft. And one week from today, we could be welcoming up to four new young Cavaliers into the fold. As it is every year, speculation is rampant. Trade rumors are flying. Players’ stocks are rising and falling. Mock drafts are being mocked and re-mocked. The Cavaliers are sitting pretty – with four of the top 34 picks in what’s widely regarded as the deepest Draft in years. They’ve got some holes to fill – on the wing and in the middle – so it’s critical for Cleveland’s braintrust to score big on Thursday night. You’ve heard the names: Bradley Beal, Michael Kidd-Gilchrist, Harrison Barnes, Thomas Robinson, Andre Drummond. Despite the fact that Michael Kidd-Gilchrist scored big points with me for working out locally at Garbage Heights, this pick should and will be Harrison Barnes, the fluid small forward from North Carolina. I think he’s the surest thing among the players listed above. He may not have lived up to the huge hype, but the kid’s been nothing but consistent. And consistency is king in the NBA. Scouts have said that Barnes could be a better pro than a college player. And he was a pretty good college player. If the Cavaliers go with the sure thing at No. 4, I’d like to see us roll the dice at 24. That type of gamble could land Cleveland a player like Iowa State do-it-all small forward Royce White. White is a unique player, on the court and off. And he’s just the kind of wildcard that the Cavaliers could use. At 6-8, he can rebound, run the floor, pass and handle like a guard. He’s tough, strong, can play the piano and recently grew a beard as a tribute to John Lennon. In the second round, I’d love to see the Cavaliers get their hands on Washington combo-guard Tony Wroten. I don’t know if he’ll last to the 33rd pick, but I’ve been known to be optimistic. Wroten would be just what the doctor ordered for a squad that could use some backcourt help. At No. 34, I’ve targeted Vanderbilt big man, Festus Ezeli. He would bring size, length and toughness to the Cavaliers frontline. At 22, he’s a mature player who’s NBA-ready. Plus, he’s got a great name for current P.A. announcer Olivier Sedra to work with. That’s my personal mock draft, yo. Deal with – or leave it alone. And that, my friends, should put the wraps on another episode of News … Around … The … League. I know I said today’s column was going to be wall-to-wall NBA Draft coverage, but here’s the thing: I lied. 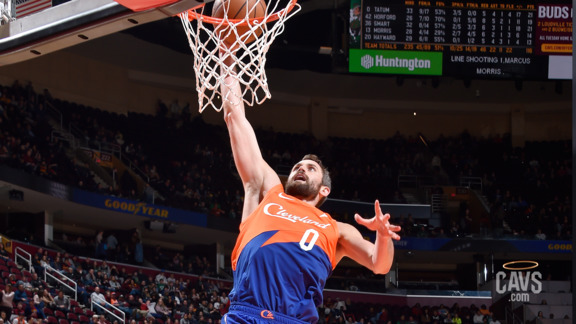 I also apologize for not getting to today’s birthdays – including Cyndi Lauper, Schooly D, Freddy Prinze and Cavs forward Omri Casspi. We didn’t have time to recap what went down on June 22 in history – like the Holy Office in Rome forcing Galileo Galilei to recant his view that the Sun is the center of the Universe. And we definitely didn’t have the available space to adequately report the story of a Connecticut man who attacked a cyclist with a link of sausages. Circumstances beyond my control arose that were just too prescient to ignore. I’m sure you’ll understand once you’ve taken a couple deep breaths and calmed down. Once you do, try to have yourselves a merry little weekend. I’m looking forward to a little landscaping and Wes Anderson’s new movie “Moonrise Kingdom” – with a little Tribe action interspersed.